1. Preheat the oven to 200˚C, gas mark 6. Cook the potatoes in boiling salted water for 5 minutes, until starting to soften. Drain well, arrange on a baking tray, toss with ½ tbsp olive oil and season. Cook on the top shelf of the oven for 20 minutes. Meanwhile, roughly chop the anchovies and capers; mix with the garlic and herbs. Whisk in 2 tbsp olive oil and the mustard. 2. Turn the potatoes, scatter with the parmesan and cook for a further 10 minutes, until crisp. Meanwhile, brush the steaks with the remaining ½ tbsp oil and season. Heat a large frying pan, add the steaks and cook for 6-7 minutes, turning halfway. 3. Remove the steaks from the pan and rest for 3 minutes. Return the pan to a low-medium heat and add the anchovy sauce. Cook for 1 minute, until the garlic is aromatic and the anchovy soft. 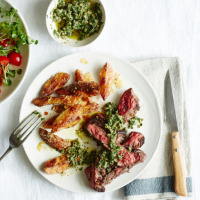 Slice the steak, spoon over the anchovy sauce and serve with the wedges.